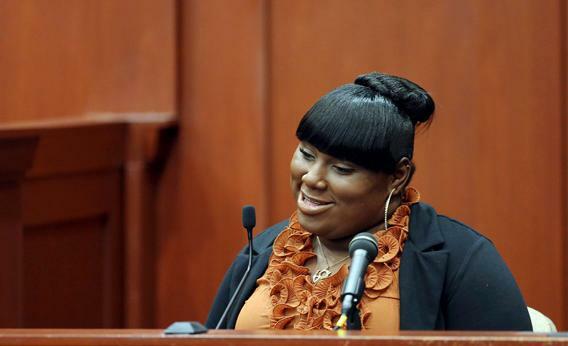 Witness Rachel Jeantel smiles towards the end of her second day testimony during George Zimmerman’s murder trial for 2012 shooting death of Trayvon Martin in Seminole circuit court in Sanford, Fla., on June 27, 2013. She surely wouldn’t smile about what people are saying about her on Twitter. Racial and socioeconomic stereotypes play differently in different contexts. The statements and mannerisms that make Jeantel a laughingstock now might have made her a viral video star outside the courtroom. As I was watching Jeantel’s testimony and the subsequent reaction, I couldn’t help thinking about Aisha Harris’ Slate piece from May about the “fairly recent trend of ‘hilarious’ black neighbors, unwitting Internet celebrities whose appeal seems rooted in a ‘colorful’ style that is always immediately recognizable as poor or working-class.” Charles Ramsey, Antoine Dodson, Sweet Brown—these people caught white America’s attention in part because they so blatantly violated normative behavior. If Jeantel would’ve been filmed saying “That’s retarded, sir” to some reporter on the streets outside her house, the Internet might well be singing her praises. Black people are celebrated when they play the fool in the proper setting.